As a pilot or aviation enthusiast, you may have had a question or two from time-to-time about air travel. You know, those burning questions like ‘Will Turbulence Kill Me’, or ‘Does the TSA actually keep us safe?’. While most pilots and aviators integrate into the travel system with ease, often the normal every-day passenger does not. These people enter a machine they know very little about, in a complex orchestration of coordinated people making the flight possible, and are at the mercy of two guys – up front – behind a closed door – touching knobs, switches, and levers they know nothing about. Our guest today, Patrick Smith, has taken upon himself to answer some of these – and really many – burning questions in air travel. As an airline pilot himself, he writes the complex into a string information that the every-day-joe can understand. Patrick is an interesting guy. Of course he loves airplanes, but that isn’t what drove him to his job as an airline pilot. Yes, he gets to fly- but just as much as the flying, he enjoyed the travel and adventure of it all. And, even enjoys the inner workings and operations of the airline and air travel system. Today we’re joined by Patrick as he talks about some of the things he does in educating the general public. But, because we’re aviation nerds, we dive in to some of the pilot talk that he rarely gets to engage in with his particular type of audience. A big thanks to Patrick for joining us on this episode. I really enjoyed the conversation! Turbulence, TSA and tyrannical passengers. This is AviatorCast episode 79! Chris: Welcome, welcome, welcome aviators. You’ve landed at AviatorCast. My name is Chris Palmer. For me, the draw to aviation started at a young age. I know I’m not alone in having childhood memories of staring spellbound at a jetliner passing overhead. Met with knowledge in the future, I one day decided that I was going to be a pilot. Through a fortunate chain of events and circumstances, I became just that. Yet, aviation for me has become much more than those magical few moments in the flair or a long rewarding cross country flight. The community of flight these days matters always as much to me as flying itself. Besides this whole flying thing, it wouldn’t be as wonderful if I didn’t have others who felt the same way to share it with. So I wonder and ask you to ponder, what draws you to the skies? Think of that and let me know. So this podcast is brought to you by Angle of Attack, a flight training media production studio and welcome to this, the 79th episode of AviatorCast. It is my pleasure to welcome you here to this wonderful weekly podcast where we get to speak to inspiring people. We may even give insight into the community or the industry. Maybe you’re a pilot looking to reignite that flame or get the courage to fly. And we also talk quite a bit about flight training, flight simulation, and other things that impact us as pilots, other things that keep us in the cockpit or prevent us from getting in the cockpit. So we talk about plenty of topics on this show but we regularly and mostly bring on inspiring people, people in the industry, people that are doing great, and even just everyday aviators on the show to talk about their careers and talk about what they’re passionate about. And I actually have some awesome news for everybody. Ashley today soloed. So congratulations Ashley for soloing. Huge kudos to you for going out there and actually working toward your license. You are now among some of the very people on earth that have piloted an airplane on their own. That is no small thing. It’s all downhill from here on your private pilot. Go after it, get it, we’re excited for you. Congratulations, and I’m going to be sending one of those Fly or Die t-shirts your way so I really appreciate it. Alright, so on today’s episode, we have a very special guest. We have Patrick Smith. Now, Patrick Smith is an interesting guy. He writes a blog called askthepilot.com where he answers a lot of questions for passenger or traveler types in the airline industry. As an airline pilot himself, he knows a lot of these things, but he is able to put it in terms that people can really understand and connect with. And so I’ve really enjoyed getting to know Patrick’s writing, he’s an incredible writer, and through his blog askthepilot.com, and I’m also excited to read his book “Cockpit Confidential.” So Cockpit Confidential is where he brings in some of those things. So rather than delay, let’s just get right in here and let’s get into Hangar Talk with Patrick Smith. Chris: Alright everybody, we are honored to have a very special guest with us today. We have Patrick Smith. Patrick, welcome to AviatorCast. How you doing? Patrick: Hey Chris. Thanks for having me. Chris: Yeah. It’s a pleasure. So tell everyone what it is that you do. Tell everyone about your website and Cockpit Confidential. Patrick: Okay. The website is askthepilot.com which began as a website for the magazine Salon back in 2002, ran for about 10 years and then I took it independent I guess so to speak and now it’s just a standalone website. The content is all mine. It’s questions and answers. It’s stories. It’s travel logs. Everything one way or the other touching back to commercial aviation. In addition to that, I’ve got the book which is called Cockpit Confidential which was recently in New York Times’ bestseller. I guess you could describe the book as an adaptation of the website. A lot of the material is actually shared between the book and the site. Chris: So your main target audience is not necessarily your everyday aviator or aviation enthusiast. Rather, it is your everyday traveler or passenger that wants to know or know more about or demystify some of the things in aviation, is that correct? Patrick: That’s absolutely correct. My target audience isn’t the person with invested interest in flying. It’s the airline passenger, the frequent flyer, the nervous flyer, the flyer who thinks that he or she knows everything there is to know about flying and of course is wrong about most of that. That person. If anything, I’m writing more for people who hate to fly than I am for people who love to fly, but that’s not to say that I don’t have as a segment of my audience people who are just into planes. I mean, that’s actually a pretty big segment of my audience because at heart, I’m an airplane geek. And by that, I mean I’m a commercial airplane geek. GA just doesn’t excite me, military flying doesn’t excite me, and it all goes back to when I was a little kid. What got me into aviation wasn’t going to an air show or going to a little airport and watching a plane do aerobatics, it was learning about the airlines. When I was a kid I used to stay up studying airline timetables and route graphs, and on the weekends we would go to the airport and we would jump behind the counters and just steal all the crap that we could find, anything with an airline logo on it. And by learning about the airlines, I became interested in flying by itself. Another segway there is my passion, for lack of a better term, for travel, and I’ve travelled a lot. I’ve travelled to, I don’t know, 85 or so countries, and that grew directly out of my passion for the airlines, studying those route maps. It wasn’t just about the airlines or the planes, it was where they were going. So that got me into geography. So all of these things together and if you read my stuff, it blends into those aspects. There is icky, technical airplane stuff, there is travel stuff, there is airline stuff, everything from airline food to customer service, it can go a number of directions. Chris: So let’s start from the beginning. And by the way a lot of what you just mentioned is in the about section of your website which was very intriguing to me and I have some follow-up questions there as well. But let’s start from the beginning. Tell us a little bit about the fact that you did fall in love with not necessarily the flying component of it but it sounds like you fell in love with the business and the travel side and how that all came together and took a career as an airline pilot sort of thing, but take us through your flying experience to actually get to the airline career and tell us about that and what you experienced there. Patrick: Sure. But just to back up a second. I think a good way to describe it all, my material, my writing, it’s not about flying strictly speaking, it’s about air travel, commercial air travel. And I often correct people in interviews when they use the word flying because that’s not what I’m about. I’m about kind of the whole kind of grand theater as a I call it of air travel, airports, airlines, airline service, the planes of course, and obviously yes to the hands-on flying part. I mean, I’m an airline pilot by profession and I didn’t happen by accident. I started taking flying lessons when I was, I don’t even know, I think 15 and it was one of those start and stop kind of things. And eventually I was I think 19 when I got my license, my private pilot license in 1985 I believe it was. So my background is all civilian. I flight instructed and built up my time and then in 1990 went to work for what we use to call Commuter Airlines, now we call them Regional Airlines, but a Commuter carrier based here in Boston, one of the Northwest Airline affiliates flying at first a 15-passenger Beech-99 which was a relic even then, so now I’m sure most people don’t even know what that is, but it’s a twin engine turbo prop 15 seats, the root of a Beech King Air or maybe it’s the other way around. An embarrassing little plane with no autopilot, no pressurization. And I did that for a few years and then flew another relic, the Fairchild Metroliner which has a long skinny pressurized turbo prop with 19 seats and then I flew a Dash-8. Then that airline went out of business and I worked at American Eagle, TWA Express. I flew cargo for DHL. I was a flight engineer on the DC-8 which was a novelty let’s just call it that. The thrill of that wore off pretty quick. But it was fun, I did that for almost four years before going to work for an extremely glamorous passenger carrier, the name of which cannot be revealed. Chris: Right, right, yeah. Great. So along the way did you have any, this question comes up every now and again, did you have any mentors that helped you along the way in that process, anyone that you kind of look up to in the aviation world? Patrick: That’s a good question, and no. I can’t think of anybody off the hand. I remember I used read Len Morgan in Flying Magazine, he was their airline guy, and bought one or two of his books later on. So he was, I don’t want to use the word hero but he was somebody who I felt I identified with. Chris: Yeah. Is he still writing for them? I think he is. Isn’t he every now and again? Patrick: He passed away several years ago I’m pretty sure. Chris: Alright. Maybe I’m thinking of the Les guy, I can’t remember his last name. Patrick: Les Abend. He’s their guy now. I actually met Les a couple of times. He’s a decent guy. That’s such a tough racket, such a tough gig being the media’s go-to person because you have to be a lot of the things I’m not which is good on camera, spontaneous, able to take complex issues and put them into soundbites. I’m much better at writing than I am at talking so I’ve done a lot of that but I don’t feel like I’m very good at it. So I have respect for Les and for the people who do that regularly. Chris: Yeah, especially with, and I think your writing speaks to the core of this, but especially with how terrible the media can be with aviation. It’s a wonder that they don’t just bring someone in house and thank goodness they do, people like you and people like Les to just cut away the crap every now and again you know and get to the real issue. Patrick: That’s a great point and that’s something that’s just endlessly frustrating but at the same time, it keeps me busy, it gives me stuff to write and complain about. But generally yeah, on the whole, the media is terrible in covering anything related to aviation, commercial aviation, whatever. In some ways, I feel bad for the guys who have that beat, guys who have to do that reporting because it’s hard to find sources and it’s hard to find the right information. Chris: Right. In any industry, not necessarily just aviation because really they have to be on the roll all the time with all sorts of different things. Patrick: I think it’s especially difficult with aviation because airlines for example, they are very recalcitrant. They don’t like to talk unless they absolutely have to and when they do, it’s just usually some boilerplate PR response. The other thing the media does that drives me crazy is when they’re looking for input for a story after an accident or whatever. They rely I think too much too heavily on aviation academics. Professor so and so from Embry Riddle or doctor of aeronautics at some university somewhere at. These people are obviously smart their work is important, but usually they don’t have an adequate grasp of the day to day realities, the operational realities of commercial flying. And so whenever one of those guys or women is quoted, I kind of winced a little bit. I wish they would go out, find more people like me or like Les, line pilots, people who are kind of in the meat of commercial flying. Chris: It’s likely they could pull someone just right from the airport that they see, an airline pilot walking down the terminal there and get better information from him than a guy that doesn’t do it from day to day, so I totally get what you’re saying there. Patrick: That’s a nice idea but part of the problem there too is it’s difficult to airline pilots who will speak on the record. There’s a lot of, I don’t know if paranoia is the right word but pilots just feel afraid to comment when they are contacted by the media. I’m the exception I guess but sometime I have to watch what I say too. Chris: Right. So I notice that you generally get some user-submitted questions on your website and people can email you directly to just send you some questions and so I was looking a few minutes ago at one you posted just several days ago. So you answer such questions as “Is it true that jetliners have windshield wipers,” you have a question about some emergencies, about a pilot sticking his head out the window. So as pilots we take these things for granted because we just naturally I guess gain that knowledge as we go along, but what are some of the more stranger questions you’ve ever received through channels like this? Patrick: Oh that last bunch of questions, some of the ones you just cited, were kind of intentionally what would you call them fun questions. But when I do the Q&A compilations, I usually tend to focus on more serious topics, from cockpit automation to how we deal with malfunctions and emergencies. I did a recent column, I believe it’s still in the homepage, all about checklists, the concept of checklists and how they’re used and how they’re not used, that kind of thing. I think far and away the number one topic in the letters I get from the traveling public is probably about turbulence. I was amazed when I first started fielding questions from random people that so many flyers, airline passengers were anxious about rough air because for us, it’s something we just take for granted. We don’t usually see as a safety issue per se, it’s usually a comfort, inconvenience issue. Patrick: But there are tens or hundreds of thousands of people out there who are just very, very anxious about bumpy air. Chris: They feel they’re going to fall out of the sky, like a wing will rip off with the slightest bump. Patrick: I got a whole essay on the website under the FAQ section where I tried to set the record straight on turbulence but I still get questions everyday. “I was on this flight and we plummeted 10,000 feet or 5 million feet…” There is so much of what I call PEF or passenger embellishment factor because it’s what I do. People can’t feel the difference between 10 feet and 10,000 feet and it’s not their fault. Or a plane was banking 90 degrees, no it was probably banking 15 degrees. So I deal with a lot of that. And then occasionally too the conspiracy theories. I don’t know how much time I’ve wasted arguing with people over cabin trails, you know what I’m talking about? Chris: Oh man, chemtrails? Oh boy. Patrick: And I finally figured out that it was just a lost cause and it’s like arguing religion, I mean, you’re not going to win. It’s not about evidence, it’s not about common sense, it’s about faith. So when I hear from those people, I’ll just send something back just pretty succinctly and not get into a protracted back and forth because it’s hopeless. Chris: Maybe you should just start confirming their fears and just send them some of those pictures from the internet of the little post in note that pilots put in the overhead panel that says “Chemtrails.” There would be some humor to that if nothing else. And I’ve had a similar experience, there was a guy, a friend of mine on my Facebook who actually said that chemtrails were real or whatever, and I wrote back and just said “As a pilot I can tell you that this conspiracy just can’t happen. So many people have to be out of the know including the pilots that it just doesn’t happen.” He’s like “Well, back in the day…” I’m like “Okay, this is a lost cause.” So I get that. Any other interesting stories that come up? Patrick: Well one of the things that is always frustrating is the fact that it seems there are a lot of people out there, I don’t want this to sound arrogant or pompous, but there seems to be a lot of people who even though they have no expertise when it comes to aviation, they’re not shy about insisting that they’re correct and I’m wrong. I get into arguments with people all the time who are pilots that have no particular background in aviation but they’re arguing with me about how a plane flies. I’ll say “This is what we do” and he’ll say “No, that’s not true” because he saw something on TV or read some little blurb somewhere. The big one there is the topic of cockpit automation and airplanes flying themselves which is one of my perineally favorite and least favorite topics to get into. It drives me crazy when people in the media talk about pilots not doing anything. Airplanes just fly themselves and we sit there in case something goes wrong and automation does all the work and people will write to me and say “Hey, it’s just a matter of time before your job disappears and planes are flying themselves right?” and I’ll say “No and here’s why…” and then these people will argue with me, “Well I read on whatever that that’s not true and you’re just being defensive” and on and on it goes. I mean, people don’t walk into hospitals and argue with surgeons about how to do brain surgery so why is it okay for so many people to insist that pilots don’t know what they’re talking about and they know the right answer. Patrick: Maybe I’m a little too hot and wound up over that but it’s only because I’ve dealt with it so often, it’s frustrating to me. Chris: It’s a real thing. We are in an information age where people feel they can get bits and pieces of information and build expertise over it, whereas for someone that’s actually in the industry from day to day, they’ve been there, they’ve seen those things, it’s a completely different story and although these airplanes are highly automated and they become, I wouldn’t necessarily say more automated over time, more technologically advanced over time, they will always be at least in my wee-mind, there will always be a pilot-aircraft interface because I just can’t see even with some of the more automated airplanes out there right now, I just can’t see an airplane ever fully replacing the critical thinking of an experienced pilot. That’s just what it boils down to. Patrick: I agree. But there are a lot of people out there who would take issue with that, and most of those people don’t know anything about flying which is what makes it so aggregate. Chris: And would they really be comfortable flying a fully automated airplane, you know what I’m saying? That scares me. Patrick: I recently was in a horrible back and forth online argument with this guy. He was insisting to me that a Boeing-777 can be landed by remote control which is absolutely not true. But he was convinced that it was true and that I was either lying or didn’t know what I was talking about, and that’s the kind of thing I have to deal with. Chris: Okay, they have rigged up airliners a couple times with remote controls. Each time I know about, they’ve crashed. There was the 727 in the desert that crashed for that Discovery Channel documentary. We actually had the guy that did that on the show, Leland Shanle, and then there was the airbus that crashed into those trees, I don’t know the full story behind that one but I know they were testing full automation there. Patrick: And there’s a famous old film, I think it’s from the 70s, maybe even earlier, of a 707 being crash-landed by remote control into a bunch of, the way I remember it is concrete pylons, and what they were doing is they were testing this experimental fuel additive that was supposed to prevent the fuel tanks from exploding when the plane crashes. It didn’t work but it’s a great video. It’s out there on YouTube, I’ve seen it lots of times. The automation thing, yeah, I mean, in carefully controlled experimental circumstances, you can make it work as means of mass travel. We’re way, way, way in the future before we see something like that. Chris: Yeah. And if you think about it, airline travel is one of the most complex types of travel in that so many things are happening fast and it’s the type of travel that people know the least about and so it’s just weird mix of professionals and the people that are actually putting their hands or their lives in the hands of those professionals, that’s the mix of it. And I think the reason why a lot of people are afraid of flying rather than afraid of a boat and drowning is because they just don’t know that much about it. Patrick: That’s completely correct. A flight, just any flight, it’s a very, the word I love to use to describe it is organic. It’s very organic. It’s always changing, it’s never the same, and I think a lot of people would be amazed at how busy a cockpit can become with all of the automation on. The automation frees your hands to do other things. It allows you to take your hands off the steering controls. It doesn’t fly the plane for you. You still have to tell all of the automation what to do, how to do it, where to do it, when to do it, and it’s never the same. I think a lot of people have this idea that a flight is this happens then this happens, perfectly sequential logical chain of events from takeoff to landing and it’s never like that. It’s always very fluid, very organic. Chris: And it is for the passengers because that is what customers of products like. They want to go to McDonald’s and they want the burger the same way every single time. When someone goes and flies, unless they’re a pilot, they don’t want to be surprised. They don’t want anything new or different about the flight. They want to have it be smooth and normal and they don’t want steep turns, they don’t want to feel the push in the seat or anything like that. They just want it to be the same thing every single time. So that is totally intentional by regulations, by the pilots that are actually flying the airplanes, by the way the airplanes are made, all sorts of things so that everyone is feeling comfortable with this aluminum tube that they don’t really know anything about. Patrick: And good for that but the downside of it is there’s a disconnect and people don’t realize how much human input is going into making that flight successful. Chris: Right, right. So let’s transition here a little bit more to your flying. So what type of flying do you actually do? I’m assuming you can tell us what type of routes you fly and what type of aircraft you fly? Patrick: Yeah, right now I fly a 757 and a 767. Most of your audience knows that it’s a common type rating, common cockpit. The planes are actually handled quite differently but the cockpit is virtually identical. I fly a mix of domestic and international routes. Going back to what got me into flying, it’s the international routes that really excite me. Flying to Africa, flying to South America, Europe, Middle East, all of that is great. But it’s also fun once in a while to just fly coast to coast or just do a little domestic trip. Chris: Yeah definitely. Is there any particular international route or continent that you like the best? Patrick: I do Africa a lot because doing that, I guess I feel like the closest I can ever be to a Pan Am pilot. That was the airline when I was a kid that you look up to, that was the gold standard. Flying to all these exotic places all over the world. So whatever the closest to that that I can do is usually what I enjoy the most. Fly to Indiana and fly to Memphis, Tennessee, there is a certain excitement that comes with international travel that you don’t see domestically. Chris: If you can speak to some of the procedural differences in flying somewhere like that as compared to the United States for our aviation listeners since they would understand some of the context there a little bit. Explain why flying in Africa would be more wild, why it would rewind the clock many years in aviation and that sort of thing. Patrick: Well in some ways it’s easier than flying domestically in the US. It’s different. I mean, I don’t where to begin on how it’s different. One of the cool things about international flying generally especially going across the ocean is that it’s quiet. I mean, when I fly across the country, I’m amazed by just the sheer number of frequency changes and just how much radio chatter there is. That can get really tedious after a while. Flying across the ocean, you establish your HF and your datalink and you get your cell call check and then it’s quiet for hours. It’s great. Chris: I’m sure there are many pilots that wouldn’t like that of course and they like the busyness and I guess those are pilots that stay more in the domestic type of flying. Patrick: I like that too on occasion but I think… You know, everybody is different but for me, domestic flying is much more fatiguing than international flying. Even when the time changes, even with the 11th or 12th hour flight and the jet lag and so on, everything taken together, it’s much more relaxed and more civilized flying long call than it is flying up and down several or even a few legs a day domestically. And I’ve done both so I feel like I can make that judgment fairly. Chris: So, if you can speak also to what you do when you get to a destination, because it seems like you are the type of guy that you aren’t necessarily doing all these just because you can fly a cool airplane and you love aviation, you fell in love with it as a kid whatever, all that stuff. It seems like you’re doing it almost half for that but half for just actually being able to travel and do this amazing thing that we kind of take for granted. So compared to the other pilots who will just sit in their hotel room, what do you when you get to a new destination or something like that? Or are you the type of guy that would just sit on your hotel room. Patrick: I don’t know if I would quantify it half and half the way you did but you’re definitely on to something. What you said is actually true. It’s not so much about flying, it’s where I’m flying and that’s a big part of it. And if I get somewhere where I’ve never been, somewhere that I think is exciting-sounding, I love to get out and basically sight see. There are certain places where I’ve been so many times thought that I look forward to a nice long layover because I’m going to do absolutely nothing. I would sit in the hotel and work on a blog and read and eat and drink and just have a good relaxing time, catch up on my rest, there’s a lot to be said for that too. But there have been places, Cairo, where we would fly and basically I would be a tourist as soon as we landed. And I’d have my guidebook and sometimes I would bring friends with me on those trips and we would go out sight-seeing and we’d make a little mini-vacation at the lay-over. Cape Town, South Africa is a good example, places like that. And a lot of our trips have multiple days of layover time where we’re in a foreign city for, 24 hours is kind of a standard but it can be two or three or four days, sometimes even longer. And so if you don’t have that spirit, it can be tough because then you’re trapped somewhere you don’t want to be and a lot of guys would just rather be flying all day than laying over in somewhere where they don’t want to be. Chris: It’s almost a way to just stay happy, you know? To stay engaged, to be doing something with yourself rather than just sitting there. As you’re talking about that, this just random kind of funny question popped into my head and that is is there any particular place where you like the food the most out of all these places you’ve been? Patrick: Well to answer that, we have to mix trips I’ve taken professionally and the vacations I’ve taken. It’s funny you bring this up because I was just working on a blogpost that I’m going to run next week all about food and how I’m just such not a foodie. Even the word foodie I hate. Chris: The word foodie does drive me nuts. Patrick: I can get by with just room service and pizza and I’m perfectly happy. That said, there are certain restaurants and certain places that I love to go. There’s a restaurant in Mexico City that I love. There’s one in Accra, Ghana that I love. But I’m the wrong person to talk to about food. I think I was 30 before I learned how to use chopsticks. Chris: Oh wow, wow, cool. Alright, well, I’ll take it, that’s fine. So, before we wrap up here, I just want to get your thoughts on I guess your inspiration for future aviators. I know that you were in a lot of ways approaching this differently than a lot of our guests because for you, it seems like a lot of your career is about the travel part of it, just I guess enjoying that new cool thing that we get to experience in this day and age, and I wonder what your advice is to future aviators who are looking into this, and we’ve had plenty og guests that have spoken to living your passion and that sort of thing. And for you, it seems pretty practical, like it just seems like you kind of know what you like and what you wanted and it just seem like the airline life made sense. So can you speak to that part of it a little bit and fit that into choosing this as a career? Patrick: Yeah. I don’t mean to dwell too much on these, I want to call them romantic aspects of the job. I mean, I like flying planes as much as I like all the stuff we’ve been talking about. And when I see a 787 taxi by, I get pretty jealous because I want to be flying that, not the 757 that I’m sitting in that was designed in 1978. So there’s that, it’s there. People getting into the business, I don’t know what advice, what would I say… Is it a good time or a bad time to be getting in? It seems like everytime you ask, there is a different answer to that. The cycles change so often. What is shaping up to be the best career in the world this year, a year from now based on global events, whatever, what have you, might look to be the worst decision you ever made. So I always encourage people if nothing else, if you think you want to fly for a living, have something else as well that you’re passionate about that you could fall back on if it doesn’t work out. And corollary to that, I think people need to realize what a gigantic sector of the industry the regional airline business is nowadays. I mean, more than half of all the departures in the US are operated by regional jets, and that’s a type of aircraft the concept didn’t exist 25 years ago, and now it’s half the industry. So a lot of guys and girls getting into the business have to be willing to accept the fact that that might be it, that they might never progress beyond that point. It might be just a career at a regional airline, not just seeing it the way we use to as a stepping stone where you’d go to work for as we call them commuters for a couple of years and then you went to a major and that was the pathway that everybody followed, and for most people I worked out. But that’s not so true anymore. And yes I know the majors are hiring a lot of pilots right now but so are the regionals and that’s just such a big chunk of the business that it might be the top of the pyramid for a lot of pilots. If you’re okay accepting that you could be a regional airline captain and retire as one, then go for it. Chris: And that’s not such a bad thing. There’s a lot to be said for thattype of career and I think like any career in aviation, you just have to be educated on what that lifestyle is going to be like and if you aren’t satisfied with just staying in the regionals, then it’s going to take some extra work obviously to get qualified to fly for a major, and it might even be a setback in many ways not only with salary but with seniority too so lots of decisions in between. Patrick: Sure. And I think the regionals are a better gig than they used to be. The pay is starting finally to come up because these carriers are realizing they can’t track and hold on to pilots with the kind of wages and benefits they were offering. So it is getting better. It’s never going to be as good as it is in a major carrier but it’s better and it’s certainly once you make captain and you’re with a reasonably stable regional carrier, it’s a good job. Chris: Great. Great. Well I appreciate those final thoughts. Where can aviators and passengers alike find your material? 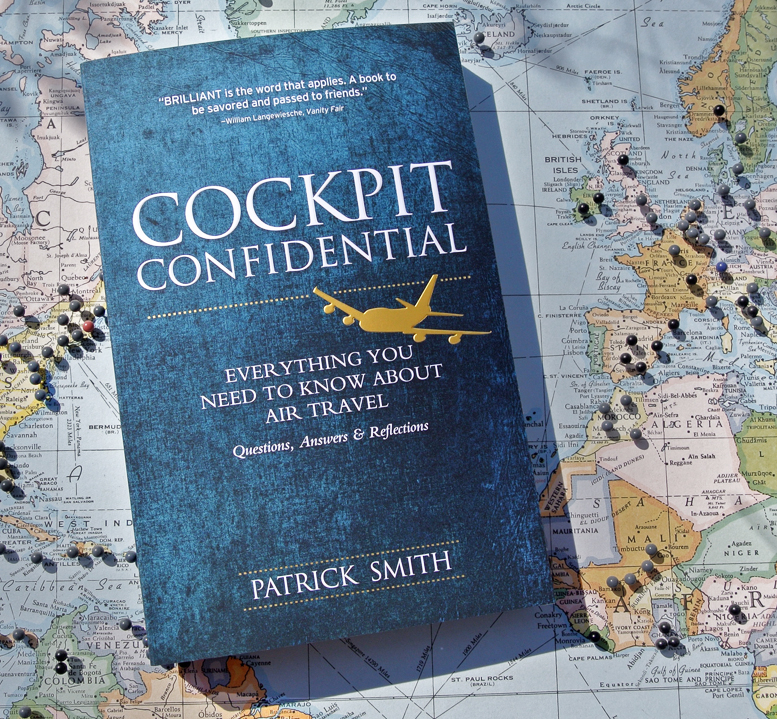 Patrick: The website again is askthepilot.com and Cockpit Confidential is the name of the book. So just look me up online, shoot me a question. I try to answer all of my mail so fire away. Chris: And I have to say your stuff is very entertaining. We were joking around a little bit before we went on the air here. You had a scathing article about the TSA and your position on it of which I agreed with almost all of those things, but you were sharing a story about your mother who went through TSA and she had dinner. Can you just briefly tell that story just to get people a taste of the kind of content that’s on your website and in your book. Patrick: Well TSA is, airport security is just a fish in the barrel. It’s always equally fun and frustrating to talk about. Probably the one topic I’ve written about more than anything else is airport security terrorism. But the story and a version of the TSA also appears on my book was when my mother was once carrying a container of frozen spaghetti sauce through TSA, and there was this ensuing argument about whether the frozen sauce constituted a liquid or a solid, and I think the one TSA guard kind of stroked his chin and went “Well it’s not a liquid but it will be soon.” And demonstrating his expensive knowledge on refrigeration and on and on it went, but how did I describe it, as a murderous marinara? Patrick: It’s a funnier story to read than to hear me talk about it. Chris: But still, that’s the spirit of the type of stuff you write about, so it’s really cool stuff. Patrick: Yeah. I try to take topics that maybe seem like they’re going to be dry and make them entertaining for the lay person. Again, I’m not writing specifically for people who already have invested interests in aviation but people who don’t and there’s a trick to that because you have to not let the conversation get caught up in jargon and pilot talk. I think I take it as a compliment where people say “You don’t sound like a pilot.” That’s exactly what I want to hear. Chris: Exactly, yep, because you got to put it in their terms and have it make sense to them. Makes sense. Alright Patrick, I appreciate your time, I know you’re a busy guy, best of luck with your endeavors in the future and thanks for joining us, really appreciate it. Patrick: Alright Chris, I really appreciate the interest. Thanks for reaching out. Chris: No problem, take care, see ya. Chris: Alright, a huge thanks goes out to Patrick for joining us on this episode of AviatorCast. If you guys haven’t already or you weren’t able to view his website while you were listening to this, go to askthepilot.com. Also check out his book Cockpit Confidential. I really like his writing. It’s both insightful and entertaining, and have some great information with it. So particularly if you are someone that doesn’t understand a lot about aviation, Patrick does a great job in explaining a lot of the concepts that you wouldn’t necessarily understand from day to day, typical common questions that happen for regular airline travelers. So very compelling stuff. Again Patrick, thank you so much for taking the time out of your busy schedule to join us. We really appreciate it. And a big thanks also goes out to the Angle of Attack crew for all that they do to make these podcast episodes possible. They work hard behind the scenes to do things. These guys are rock stars, I really appreciate all they do and I want to recognize them each and every week. And of course, thank you, the listener, for subscribing each and every week. I really appreciate it. If you guys can spread the word in whatever way you can, I’d really appreciate that too. Share it on social media, tell your pilot friends about it, whatever it is. Do so if you enjoy it. I wouldn’t expect you to do it if you didn’t enjoy it. If there is any feedback you have for me, you can always reach me at me@aviatorcast.com. Pretty easy, pretty simple, and again, if you guys leave a review on the show and I read it on the show, I will send you a Fly or Die t-shirt no matter where you are in the world. Again, I really appreciate it guys. You guys are awesome. Join us next week. I will line up something else. Until next time, throttle on!